In both senses of the word. 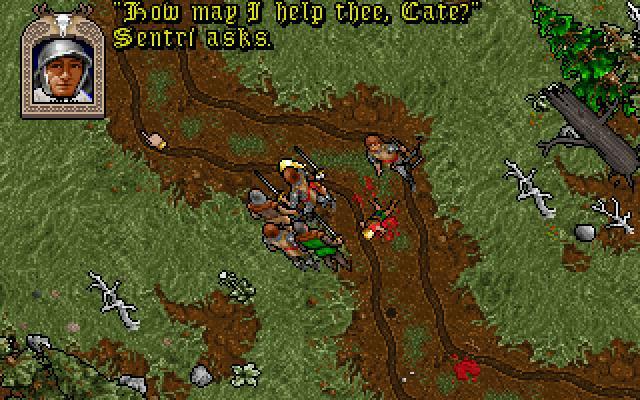 After Cate’s timely death on the road I feel rather disconnected from Ultima VII. My initial wonder at the astonishing amount of detail present in the game has rapidly given way to an encroaching sense of ennui at the UI and the fact that that detail makes performing even simple tasks a chore. • Double click on Cate to open her character sheet. • Move the character sheet somewhere where it won’t be blocking my view of Iolo. • Double click on Iolo. • Move Iolo’s character sheet somewhere where it won’t be blocking my view of the party. • Double click on his bag. • Move the bag window somewhere where it won’t be blocking my view of the party. • For every party member present, double click on a piece of food in Iolo’s bag and then on the party member. • Close all the open windows. And feeding is something that has to be done roughly every twenty minutes. Even Dwarf Fortress doesn’t require you to micro-manage your dwarves eating habits (although you’ll probably end up doing it anyway). Another item on my long laundry list of complaints is the game world being pitch black at night time – which, bizarrely, includes character sheets and inventories so I really had to squint to see what’s in there. It pretty much makes the game unplayable, so I wandered off to try and find an inn to sleep the night away only to discover that the inn was shut. Shut. It’s like the first rule of RPG 101 is that inns never, ever shut, yet shut it was and I was out of luck. Blundering back up the road to try and find one that was open, I was waylaid by another band of brigands. Spark exploded in a shower of gore while I desperately tried to double-click on Cate so that I could activate the combat AI. I misclicked. Cate started a conversation with Sentri while Shamino’s head was hacked from his shoulders. Frantically hammering “Bye!”, she then watched as Iolo had three feet of solid steel rammed down his gullet and stood there impotently while the two robbers slowly beat her to death with the flats of their swords. 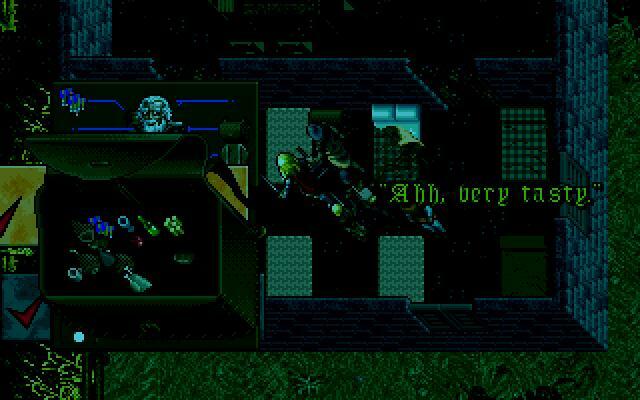 It seems pacifism isn’t a viable strategy when facing Ultima VII’s criminal element. But as we’ve seen even death is no release for the Avatar and Cate woke up hale and hearty back in the Fellowship stronghold, her companions – whom she’d last seen watering the grass of Britannia with their various vital fluids – mysteriously restored to her side. Everyone has a good chuckle. Ho ho ho, Avatar! You do get yourself into some hilarious scrapes! Don’t worry about bad guys mashing you into a bloody paste, we’ll be right along to scrape your remains off of the road and you’ll be wrestling with the unwieldy movement system again in no time! This, as far as I am concerned, is the last straw. I’m not having fun with Ultima any more. I don’t want to load it up because I know it’ll mean another episode like the time I spent five minutes trying to drop a dagger on the floor (no, Avatar, not there! That’s too far away! And that’s too close! And there? Iolo’s standing there, so no dice!) It’s been an interesting experience, but I am now very much aware that while the rich, textured world of Ultima is a lost relic from a bygone age, so is the gameplay. I enjoyed talking to all the characters, I enjoyed the creepy overtones of the Fellowship and the way they were set up as a pervasive influence in British society, and I even enjoyed some of the in-jokes like the Kilrathi fighter and the Hoe of Destruction. But the barriers the game puts between me and the pursuit of these promising plot threads are just too damn finicky and frustrating, and I can’t be bothered any more. 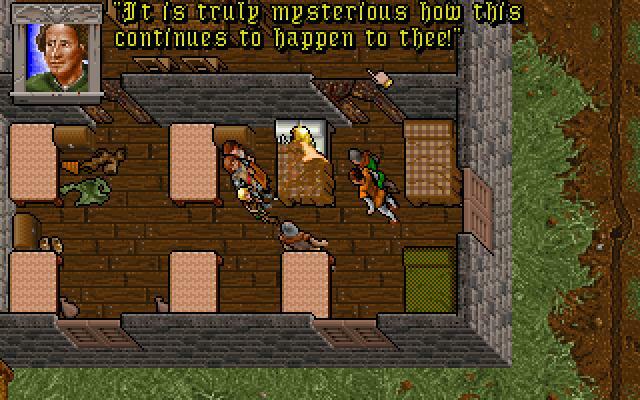 I can certainly see why Ultima gets put on so many RPG Best Of lists – it does things with its world that no modern games even attempt, and exploring it is a refreshing change from the visit-four-areas-and-then-the-final-area trope of the Bioware games. However, based on my experience of playing the damn thing the Best Of list is where it should stay. Like Dwarf Fortress, like innumerable Paradox games, Ultima VII is fun to read about because of the variety/emergent detail its huge world allows – but like Dwarf Fortress, and like innumerable Paradox games, when the time comes to actually play the damn thing I wilt like a whole multitude of thous before the stupidly fiddly and unintuitive UI that detail demands. So farewell, Britannia. You were beguiling and mysterious to start with, but the sheer amount of red tape the average visitor has to deal with really discourages tourism. I’m sorry to leave you in the hands of the insane dictator that is Lord British, but Cate is going off to find a more interesting and far more rewarding line of work, like invading a third-world country or something. Sad to hear! But I do admire you for trying it. Ultimately, however, I think there is more mid-90′s nostalgia involved in my playing the game again and again than anything. I remember being 13, playing this game with my bakelite mouse, while skipping school and listening to old “The Eagles Greatest Hits” tapes on “repeat.” I never try to beat it anymore – only to wander around with old “friends,” manipulating items here and there and desperately trying to get lost in a world I know better than my own neighborhood. What’s best, U7 temporarily cures my wanderlust when I’m stuck in the middle of lunch break at my quotidian desk job.